The City category embraces all Smart City & Smart Building ICT solutions. They are the backbone of any urban infrastructure built today. There is a growing need for specialized tech solutions that develop and sustain the buildings of the future and improve cities. By implementing IoT into urban infrastructures, a wide range of benefits can be gained in the management of public services and sustenance of buildings. Examples of such benefits are the predictive maintenance, waste management, better air quality, energy savings, traffic management, and smart lighting. Be a part of the change and submit your breakthrough solution to make cities and its buildings smarter. The Internet of Things communication plays an important role in a wide range of healthcare applications, making possible not only to monitor the patient’s health but also to instantly send data to devices owned by physicians, hospitals and/or the family. The demand for new and improved remote health and monitoring systems as well as the need to monitor and share health and wellness data is growing rapidly. Be part of the IoT healthcare revolution and submit your innovative solution. Homes are getting smarter every day as more of our household items become connected devices. Whether it is the thermostat, lighting, hi-fi system, washing machine or your door lock – they all communicate wirelessly with each other and with you. These devices not only increase convenience, but they also help make homes more comfortable, more secure and more economical. Thus, smart homes are boosting the market for consumer electronics, telecommunications, and construction industries. Be a part of shaping the future of reliable IoT/WT solutions for smart homes by submitting your solution now! As IoT and M2M technologies are embedded into materials and mechanical parts, we are able to gather more and more data from these sensors during their use. Big data analysis and high speed communication will become more crucial than ever for evaluating performance metrics. Companies can then to use this technology to become more efficient – including further automation, self-optimization, self-configuration, and self-diagnosis of the machines, parts and material. Submit your solution and be part of the change, helping smart manufacturing to become even smarter. Enhancing agriculture has an impact on all of our lives! Multiple factors like the air temperature, soil quality, proper maintenance and right timing affect the success of global agriculture. New connected technologies like the Internet of Things help farmers monitor production, increase performance and minimize waste. Sensors provide valuable real-time data that ease decision-making based on accurate insights and alert (remotely) when something is wrong, creating an optimal setting for precision farming. Be part of the future of agriculture by submitting your solutions to the IoT/WT Innovation World Cup® now! Connected devices are drastically changing our lifestyle. We are now able to track our own performance metrics conveniently via our smartphones with the help of wearable sensors. This also extends to gaming, where sophisticated wearable technologies are unobtrusively integrated into user-friendly devices. For instance, smart glasses, smart watches, smart clothing and smart jewelry all collect information without having to pull out your smartphone! Thanks to gaming experiences, the user can better engage with their environment and enable people to interact with what matters to them. Though gaming and fitness devices are not the only things that are increasingly influencing our lifestyle, but also connected devices for music, travel and tourism experiences. Submit your solution and be part of the change, helping lifestyle to become funnier! Cross-channel is becoming the rule in retail. Consumers not only want to buy their clothes in shops, but also online. Innovation in retail is about finding unique ways to enhance the shopper’s experience from start to finish and to increase the retailer’s customer engagement. Augmented reality is being increasingly adopted, allowing shoppers to experience products anywhere, anytime in a fun and interactive way. Robots or chatbots with Artificial Intelligence are becoming more popular and are booming in the B2C industries. Be a part of changing the face of the retail experience by submitting your game-changing solution now! The transportation category spans across both personal and commercial transportation solutions including connected cars; smart sea, land, and air transportation solutions; as well as commercial logistics operations. The car is one of the most sophisticated mobile devices in the Internet of Things (IoT). Linked to the cloud by way of wireless technologies, smart chips, onboard computers and mobile apps, connected vehicles are driving new business models and disrupting old ones. The combination of Wi-Fi and IoT technology paves the way for many services for drivers and passengers alike, such as enhanced navigation, real-time traffic, and parking information, streaming infotainment and integration between dashboards, smartphones and wearable devices, and connecting the smart home with the car. New technologies are also transforming the logistics and transportation processes with major implications for industry players and consumers alike. Whether it is a logistics solution connecting companies with their containers or trucks for easier and safer cross-border trading, or navigation applications, tracking your objects live via GPS. New vehicle-to-mobile connections, vehicle-to-vehicle and vehicle-to-infrastructure connections revolutionize the infrastructure sector. Techpreneurs from all around Europe are invited to become the EBV IoT Hero. This special prize of the Innovation World Cup® is powered by EBV Elektronik the leading specialist in EMEA semiconductor distribution. EBV enables European techpreneurs to bring their solutions to market successfully. Contestants of the Innovation World Cup® can order three development kits for free and can access EBV´s StartmeUp team, a sales division dedicated to start-up companies and electronic newcomers, including engineering, sourcing, and logistics support. 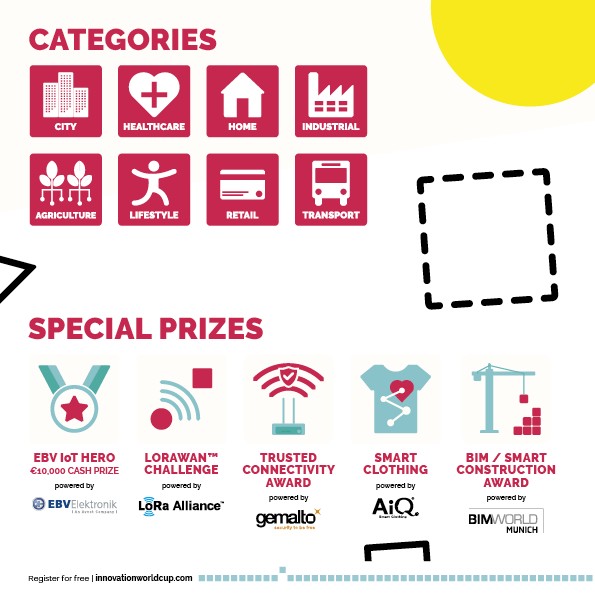 The EBV IoT Hero will have the opportunity to win a cash prize of 10,000 Euro. Participate in the Trusted Connectivity Award challenge and impress us with your built-in cellular wireless connectivity designs! To learn more about IoT Connectivity enabling trust, check out Gemalto’s dedicated IoT website and extensive IoT developer community! Consumers use more and more wearable technologies in their everyday life. Smart clothing is the next step into the future with endless possibilities to integrate technology into clothing. One day everybody will wear clothing that is networked in a subtle and intelligent way. AiQ is focused on bio-signal acquisition and processing and IMU based human motion acquisition and analysis for a wide variety of applications in Elderly care, Remote Patient Monitoring, Wellness, Industrial Safety, Rehabilitation, Sports, VR among others. AiQ Smart Clothing is a pioneer in this area and has partnered with the Innovation World Cup® Series to look for cutting-edge innovations. This includes completely new textile solutions, including fabric, garment engineering, as well as technologies or power systems that can be integrated into an existing piece of clothing. Winner of the Smart Clothing challenge by AiQ Smart Clothing will be supported in transforming their prototype into mass production and aiming at high volumes. Every day more than one thousand houses have to be built to meet the demand for new homes for the growing worldwide population. This can shortly be realized only if smart and innovative technologies integrate the construction process supported by Building Information Modeling (BIM), also enables the later monitoring and facility management of existing real estates. Have a look at this market and check your IoT solution. If it could bring a value to the building and construction industry, enter the BIM / Smart Construction Award. Pitch their solution and be awarded at the BIM World MUNICH Conference, the leading BIM event in Europe, on November 27th / 28th, 2018! Get the chance to implement and test their solutions for up to three months in one of the IoT Experience Labs for BIM and Smart Construction solutions of the Fraunhofer Institution! Apply now – unlock the tech potential of the construction and real estate industry with your solution!